Question: There are moments during the reading of The Zohar when it’s difficult to perceive the text and then it’s easier to stay in intention. But what can I do in a different state, when during my studies I feel excitement and joy? Answer: We are going through various states until we form the correct request. It includes a variety of components. It’s possible to compare it with a delicious dish that has dozens of ingredients. We don’t need to keep all these components in our head, our mind, because they accumulate and line up in us, and what has been built is in you. You shouldn’t worry about it; you take care of other things, as a chef preparing a dish who automatically knows what to add and what needs his attention. Since our vessel, Kli, is a desire, not reason, then a habit becomes second nature. So, you are not worried about what is already included in the desire, but rise above it to other, more advanced concerns. Why Is It So Difficult To Keep The Intention? On its own, what is the study of the wisdom of Kabbalah? Everything seems simple; people that want to study come and there is an expert that teaches. He sits and he talks, and whoever wants to hear comes and listens. There are many places like this in the world where people are studying all kinds of things. But when a man comes to the study of the wisdom of Kabbalah, quickly he reveals that the students need to be connected to each other. So, ok good, there are even quite a few examples of this. People connect in frames of a group; it could be a class or a group, etc. Later, the quality of this connection is spoken about. So it becomes understood that the issue is not only in studying and all the other things that accompany it, but the main thing is the connection. How could it be? I came to study some kind of wisdom. I’m willing to do it together with others; I’m willing to join them in order that the connection between us will be in accord with the study. But no, I’m being told another thing, “You need to connect with them to such a measure that you will stop feeling your existence, only they will exist for you.” This I do not understand, but they demand this from me in order to understand the material, which on its own is not important in the meantime. In this matter, a reversal of 180 degrees awaits me: Before the material of the study was important to me, I wanted to know something new, to receive wisdom, and now it is clear that the material is not important at all, rather the connection is. I hadn’t even thought about something like that. So what has to be done? How can one understand that everything is attained in connection, that we will never understand the sources if we don’t begin to connect, because the wisdom of Kabbalah speaks only about the manners of connection and not about anything else? We stumble on this problem. And that’s why the Rabash began his articles from this: love of friends, the purpose of society, the order of the gathering of friends, etc. Without this, we simply have nowhere to go, but we dismiss what doesn’t fit our desire and public opinion. Even though it is hard for me to receive the importance of the love of friends, I need to convince myself that I am here only for one goal, to connect with the friends in such a way as to annul myself before them, to lose self-existence and to exist only in such a measure that I can bestow to them, only according to their desire. We already know that “Israel” is called the giving vessels, Galgalta ve Eynaim (GE), and the “nations of the world” are the receiving vessels, AHP. Accordingly, the vessels of Israel must correct themselves first and give the Light to the nations of the world. This task was assigned to Israel from Above, meaning everyone in the world who gets the awakening by means of the point in the heart (•)—a spark of desire, which suddenly breaks out in it. In addition, the category of “Israel” includes the descendants of immigrants from ancient Babylon who had the point in the heart in the past. 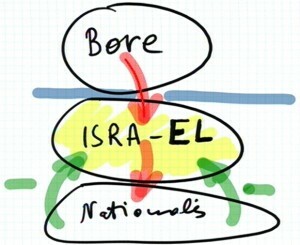 Thus, “Israel” is a difficult, complex concept. And namely these people have an obligation to correct themselves to become the “Light for the nations,” in other words, to transfer the method to, provide help, and support all the other people whose point in the heart is still hidden. After the breaking of the souls and mutual inclusion, this point exists in everyone, but in the category of the “nations of the world” it is still dormant and they are not aimed “straight to the Creator” (Yashar-El) and do not feel this urge (↑). That’s why there is a transitional link Galgalta ve Eynaim, Israel, the vessels of bestowal. Their nature is the same as that of the Light (OR), and they can pass it on to the nations of the world in a suitable form so that people understand how and by what means they can exit the current crisis. There is a very important point. The Creator, the Surrounding Light (Ohr Makif – O”M), also shines on all people. From this everyone experiences the negative (-), the troubles and problems. However, they do not feel able to deal with this minus, with this unfulfilled desire (Hissaron). They do not get help and support from Above. The positive does not come (+? ); there is no method. That is why the nations of the world feel hatred towards Israel whom they blame for all their misfortunes. We are talking about the laws and forces of nature. Nothing can be done; they operate in this way. 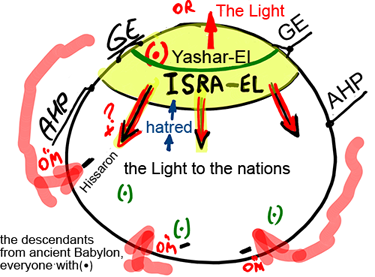 Until Israel is able to balance the desires of the nations that were awakened by the Surrounding Light with the inner Light of the Creator, until the “minus” of the nations is neutralized by the “plus” on the part of Israel, they will constantly hate Israel and blame it; it is their lack of support, which they do not know they need, that is precisely the cause of all their troubles. Natural disasters, famine, and disease, all that will be blamed on Jews, as has happened many times. All this stems from an imbalance between these forces, which we have to balance so that we are moved not by the negative, but by the positive that provides the remedy for disease in advance. In essence, everything revolves around this scheme. So, if something wrong happens in the world, then those who belong to the category of Israel are to blame because they do not bring the world the compensating Light, and as a result, allow the bad force to break out. Question: You say that by reading The Book of Zohar we have to discover inside us the same spiritual attributes it speaks about. But it’s hard for me to think about the connection with the friends at the same time. Answer: For the time being we can’t identify these spiritual attributes inside us, they are concealed too deeply. You sometimes get so angry at someone you love, for example at your wife, that you begin to hate her. If at that moment someone says to you, “but you love her,” you will get mad and say: “I love her?! I simply hate her!” Love is concealed and hate is revealed. Sometimes it’s the other way around, a few gentle words evoke the love in you, and you love her and everything is just great. So where is the hate? It’s as if it doesn’t exist. Similarly, inside us there are all the spiritual discernments that The Book of Zohar speaks about, Jacob, the Torah, HBD, HGT, the middle line. But they are all concealed internally, and we don’t identify them at the moment. The main thing is the intention. I also asked Rabash a similar question when we studied such “technical details” like Kruma de Avira or Mochin de Avira, the 13 corrections of Dikna, etc. in TES. It didn’t concern me at all, I couldn’t relate to them. So I asked him whether I could think about myself during that time: Who I am, what I am, for what reason and why? Whether I should suppress all the internal clarifications that come up and think only about what is in the book. Rabash said: “No.” If you care about the right intention now and about how to approach bestowal, then think about it. Later you will see that everything you think about the states that you go through, about the group, and about the Creator and everything that is written in the book is actually about that, you will suddenly feel: “Wow, it’s about me! How did Baal HaSulam and the authors of The Zohar know that I would be thinking precisely about what is written in this text? !” That’s what will happen. And what he sees is that now he is in a worse state than when he didn’t pray to overcome the desire to receive, which is an answer from Above to his prayer. We cannot properly determine when in fact we really are asking from Above and when we receive a response. While it may seem to us that we are praying and asking, it’s not we who are praying and asking. We were simply given such a desire from Above, and we feel how it goes through us. This prayer is not on our account. So a person shouldn’t say that the Creator doesn’t listen to his prayer. He should rather say that the answer came from Above, and is not what a person prepares, but what is prepared for him from Above, which is for his own good, and he should know that. It is clear from Above when to answer a person and what to give him: which thoughts or desires. He has no freewill here. Which means that a person should know how far he is from bestowal, and that every part of his body is against it. And a person asks the Creator for something that there is not one part in his body that agrees to what he is asking of the Creator. So how can he ask for that? And then a person sees something new, which he didn’t know before he began to ask from the Creator, that he should be given the power to overcome his body, so that he would be able to act only in favor of the Creator and not for his own sake. A person sees that there is no point in these requests. …and the new recognition that a person attains is that he sees that the body doesn’t agree to pray for the annulment of the desire to receive for its own sake. So the question is why a person sometimes does want to annul his desire to receive, which means that a person often sees that while he is asking the Creator to give him vessels of bestowal, his whole body rejects it and what he prays for is only lip service, which means empty words. In any case he sees that there are times when he can pray from the bottom of his heart. The answer is that this is already the answer to his prayer, which means that the Creator gives him the power to pray about that from the bottom of his heart. Therefore a person has to be hopeful that the Creator will bring him close to Him. In the meantime we can’t know when we receive a desire to pray from Above and when we pray out of our own will, below. All this will be revealed later. This is done on purpose, in order to confuse a person and to let him feel disoriented in the egoistic desire, so that he will begin to ask for forces of bestowal, a desire to bestow. It’s only by the force of bestowal, the force against him, that a person can be critical of himself and see the truth. But if a person has only one force, then it’s either an angel, when it’s only the force of bestowal, or an ordinary animal that belongs to the levels of the still, vegetative, and animate nature and which have only the force of receiving. But it’s when a person is confused and has doubts, when he can’t find himself in these states of confusion, that he is simply torn apart, that he can find the connection between the two parts of creation: the Creator and the created being who is above his limited mind and feelings. He should rise above his request, above the actual prayer, and the answer for it, like Malchut that rises to Keter, which is called a true “prayer.” The Creator is the answer to the prayer, and then the two connect in the full adhesion of a person and the Creator. And so a person has to be hopeful that the Creator will bring him close to Him. Since we are constantly nourished from Above, we only have to be aware of the bestowal that comes from Above and goes through us and then back up. We have to be grateful for that, to acknowledge the greatness of the goal, that “there is none else besides Him,” and that He is good and benevolent, and to yearn for connection in every situation. If we constantly try to stabilize this in the true form, and not as it seems to us in our concealment and exile, then it will be a true prayer. Question: Anti-Semitism is on the rise in Europe. How should we relate to it? Answer: As we all know, all things are rooted in two opposites. On one hand, I don’t have to love the one who hates me, and on the other hand, I have to work on correction. On one hand, I have to understand that I am hated to the same extent that I hate in the eyes of the Creator, because the whole world is a replica managed by Him. On the other hand, I have to do everything in my power in order to correct myself and my relationship with the Creator, for this I correct my relationship with the world. The Jews don’t have to explain to the Europeans how good they are. They are so eager to prove to the world that they don’t want to harm anyone and that they help everyone, but who cares? No one. In corporeality the Jews cannot determine anything. No matter how nice they are, the world will understand more clearly that they are not fulfilling their role. Subconsciously the nations of the world want only one thing from the Jews: “Give us the connection to the Creator.” It is because the Jews are the transition phase, we have to do it; it is our duty, our only debt to the world. So why do the Jews take other tasks upon themselves? No one needs culture, education, science, or success in any other field from the Jews. Humanity doesn’t value the enormous contribution that the Jewish people are so proud of. It is as if they say to the Jewish people: “We don’t want to acknowledge that, since this is not what we expect of you. According to the plan of creation you have to bring us the Light that Reforms. Without it, everything else is worthless…” Eventually, the general system is becoming increasingly more anti-Semitic. Anti- Semitism is a negative attitude to what Jews are needlessly dealing with in this world. The hatred towards Jews will only grow to catastrophic proportions. It is because Jews are not dealing with what they should. Israel (ISRA-EL) is assigned to be “a Light unto the nations,” the link, the “transition” between the Creator (Boreh) and the nations, the “kingdom of priests” that is supposed to teach the world. Baal HaSulam speaks about it in his articles “Matan Torah (The Giving of the Torah)” and “The Arvut (Mutual Guarantee).” Only the nation of Israel can pave the road to the Light for the world, but instead it creates a “jam” and blocks the passage, creating a roadblock. So how is it possible not to hate it as a result? It is obvious that the nations of the world treat it negatively (-). Because Israel means straight to the Creator (Yashar-El), it is these people who can communicate with the Creator. The Israeli nation has received this ability and then it was shattered and dispersed among the other nations. The preparation for that was from Above and now all those who belong to the level of “Israel” have to start correcting themselves in order to bring the Light to the nations of the world (Nations). On the whole, it is impossible to see the outcome of the current events in the short run. We have to be above all that, not wanting to harm anyone. The idea is that if I cannot bring the world to the end of correction right now, then all the evil events that happen in the world, no matter who feels them, are because of me. It is my fault. So I have to hurry and bring them the method of correction in every possible way: by books, on the Internet, in courses, and also in the internal system based on the connection among us. If something bad happens somewhere in the world, it is only because I don’t bring the world to correction. After all, only I can do that. People blame the Jews since it is human nature; a person feels that way although he doesn’t really know why. It is “natural knowledge.” Although I explain this to you and to the whole world, you still don’t understand why we are to blame for everything that happens. Do you want to stop the bloodshed? Go ahead, do something, bring more Light that Reforms to people, pray for them. It is you who should bring them correction, and in that sense the world belongs to you. Everything depends on how quickly we hasten the correction. I turn to all our friends all over the world and to our TV viewers; let’s feel a bit more responsible. Opinion (Nouriel Roubini, cofounder and chairman of Roubini Global Economics): “Speaking at the World Economic Forum in Davos, Davide Serra, founder of leading hedge fund Algebris, and Nouriel Roubini, the head of Roubini Economics known as Dr Doom for predicting the financial crisis, set out the case against those who think quantitative easing (QE) and low rates are benign policy tools. “’When governments borrow, they are taking money from our children. QE is the same – we are lowering returns for future generations. QE creates an inter-generational dilemma,’ Mr Serra said. My Comment: At least many begin to understand that something (although not what) needs to be changed, but politicians do not hear. The realization that some understand the need for change, but others not, is already movement. But the real awareness must be in recognizing the need for full integration of all of humanity as a condition (the ultimate goal) of our development given by nature (evolution). This can be achieved only by using the property of unity, the unifying force, which is revealed in the desire to unite according to the method of Kabbalah. Nature is integral on its three levels: still, vegetative, and animate. The human being, evolving from the animate level, must himself recognize the need to “fit” in the general picture of nature as its highest integral part.